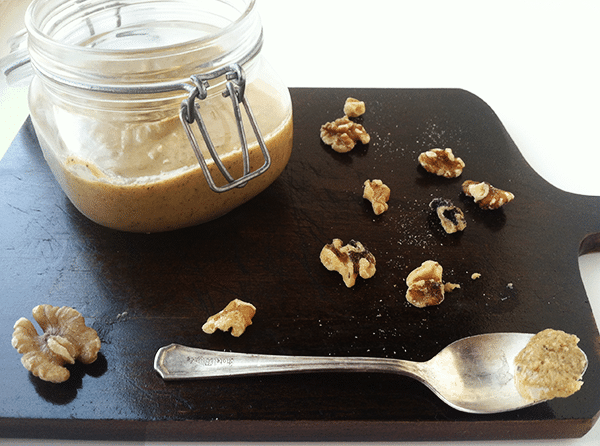 Walnut butter is a delicious homemade spread. 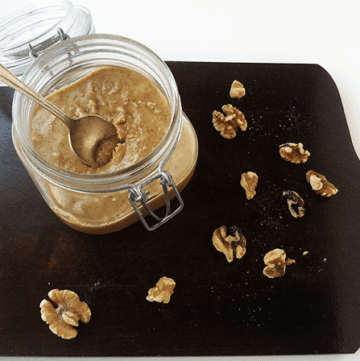 Just like peanut butter and almond butter, walnut butter is perfect to use in both sweet and savory recipes. 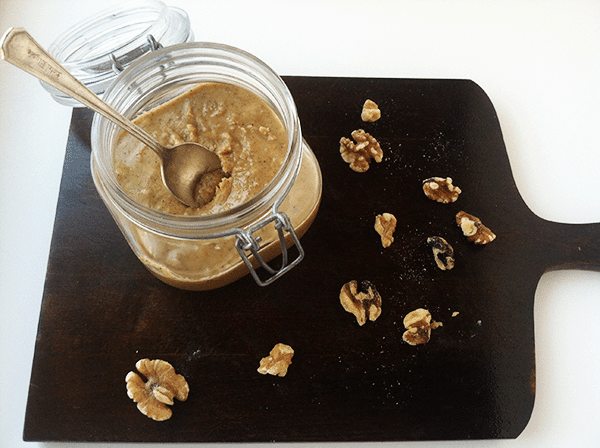 Making nut butter spreads at home is much cheaper than buying them from a store. If you’re like my husband or have a husband like mine, he has texture issues when it comes to his food. He won’t eat nuts in anything because of the texture. Well, I fixed that little problem with my walnut butter recipe. My whole purpose for making it was going to be to use it in making a cake. But, I ended up making walnut butter cookies and I want to make some bars with it, too. I’ve been on a cake and cupcake kick for quite a while. I think it is time for some changes in the dessert department! Actually, this is a little tip about nuts in general. Here’s a fact that I learned from Rachel Ray. Keep nuts stored in the freezer to get a longer shelf life out of them. If raw nuts are sitting in a cupboard, the oils will go rancid quicker. Now I keep all my nuts in the freezer door. True Story. I like to eat it straight from the spoon, but it is also perfect on toasted homemade bagels. I hope you enjoy the recipe! Pour all your nuts into the food processor. Turn on high and watch the nuts get chopped. Every minute or two stop the processor and scrape down the sides. The walnuts will look real course, then ball up, and finally thin out and get creamy. The whole process took me about 10 minutes. I just let the processor go for as long as it took for a smooth, creamy, walnut butter. I stored my walnut butter in the refigerator. Wow this is such a good idea I really like this, I bet it tastes so good and would be really good like you said in cookies or bars. Good tip as well about keeping nuts in the freezer, I never thought to do that, my cupboard is full of half open packets of nuts. I am now moving them to the freezer! I have never heard anything about keeping nuts in freezer? Interesting..
Rachel Ray always says it on her Food Network show. That’s where I got it from. This is great! For lunch, I took 1 tsp. 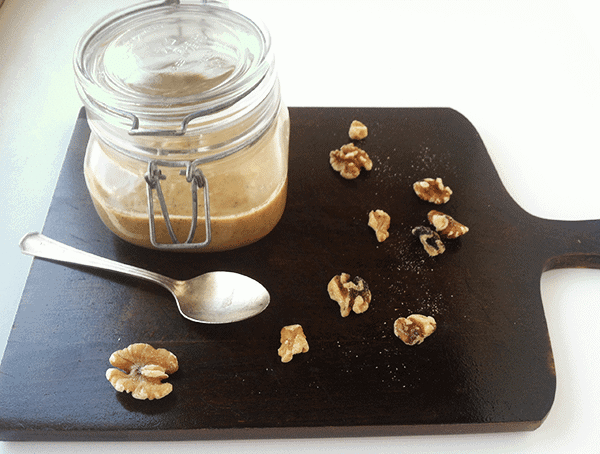 walnut butter, 1/4 tsp. ground cinnamon, 3/4 tsp. honey, mixing after each addition. Then I added a small amount of olive oil to thin the mixture, and then added lemon juice to reach the consistency of a thick vinegarette. I used it as a dressing for a shredded zuchhini and chopped tomato salad. Amounts can be adjusted to personal taste. Delicious!